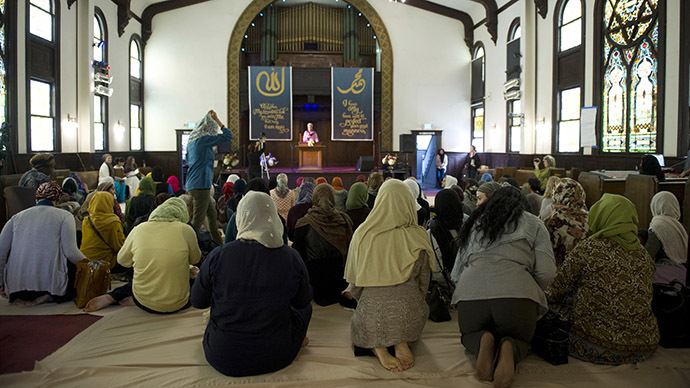 The first all-female mosque has opened its doors in America, with up to 150 women coming from across the country not to miss the historical prayer lead by a female imam at a former synagogue that's now a multifaith center in Los Angeles. Some women traveled to LA from as far as New Jersey, with a flight time of over 5 hours, to be a part of what many hail as a breakthrough. In traditional mosques, women pray separately from men, which as many complain, can distance them from the speaker. Some women also feel excluded for other reasons, such as male-only Quran studies. "I think that's important especially being in a younger generation, in America, to go to Friday prayers as just females and listening to female lead prayer versus going to jummah [the traditional Friday prayer] with a ton of other people and being a little segregated in between," Hina Warsi, who flew in for the special prayer to LA from Las Vegas, told Reuters. So..like....I have all intentions of visiting the women's only mosque in LA. I WILL GO TO THERE! "It's been such a long struggle for women to get a voice in so many religions and women in Islam have had the same struggle," another believer, Noor-Malika Chishti, said. "We have the right and responsibility to our faith," Edina Lekovic, an activist with California's Muslim Public Affairs Council, told women as she delivered the first sermon on Friday. Men were asked to leave, and some of them said they didn't mind. According Hussam Ayloush, of the Council on American-Islamic Relations, some Muslims may actually prefer integration to segregation to draw more women into Islam. "A mosque is a place of worship where all segments of the Muslim community, men and women ... should feel at home," he said. The women's-only mosque is the brainchild of Hasna Maznavi, 29, who says she wants every woman to experience what it feels like to learn from a female religious authority in the mosque. According to the co-founder of the Women's Mosque of America, the mosque in LA is neither Sunni nor Shi'ite and occupies the "middle ground" of politics. "We just wanted to have a safe space where women could come and get inspired and hear from a female khatiba or someone who delivers the khutbah or the sermon and that's an opportunity that we don't get in other mosques. The speaker is always a male imam and not only that, it's very hard to access the imam because of the way the mosques are structured architecturally. Sometimes the men and women are completely cut off from one another. This mosque gives us a chance to connect with our leaders and also with one another in a way that we wouldn't in another environment," Maznavi told Reuters. She founded the Women's Mosque of America with Sana Muttalib. Jummah is currently scheduled to take place once a month, but the mosque's founders hope the prayers will be held every Friday in the near future.